The laser targets the darkness of the melanin pigment in the hair follicle. Since melanin is only produced in the growth phase of the hair, the laser must target the hair follicle during this cycle. At any given time, 20–40% of the hair in a particular area may be in a growth phase. Therefore, more than one treatment needs to be scheduled, preferably at 6–8 week intervals. With multiple treatments we can ensure that all hair follicles are being disabled. Can all hair and skin colors be treated effectively with laser? There is no one laser that is ideal for all skin colors. At Michael law, MD and Blue Water Spa, we have a laser for light skin and a second laser for dark skin. The Alexandrite laser we use has been evaluated as the most effective laser for removing hair. However, this laser is ideal for light skinned individuals. The long pulsed Yag laser we use is ideal for dark skinned individuals. The longer pulse means that the laser energy will be absorbed by the root of the hair and not the surface of the skin. 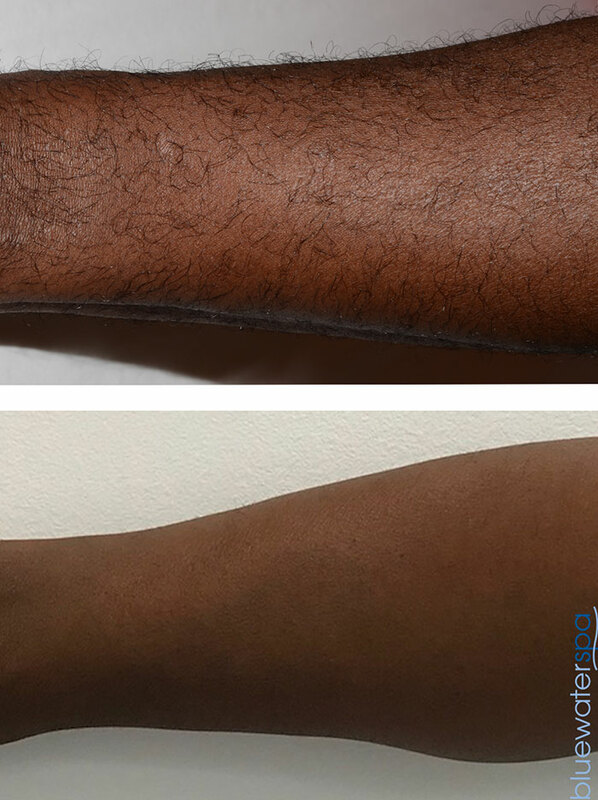 This means laser hair removal will be safer and more effective for dark skinned individuals. While laser hair removal can be performed on virtually any skin color, the color of the hair is the most important factor. The laser is attracted to the melanin (the dark pigment) in the hair follicle. Thus, darker hair is treated most effectively. If your hair has a blonde, red, or dark gray root, you may not be a good candidate for laser hair removal. Do you offer complimentary consultations? Absolutely. We believe that a consultation is important for any client considering laser hair removal. We will perform a test spot so the client can see how the laser feels and we can answer any questions so the client can better understand what the laser can do. We can also determine if you are a good candidate for laser before you commit to any treatment. However, some people would like the idea of receiving treatment the same day as a consultation. If you are a good candidate for laser hair removal, a treatment can be performed the same day. Does my hair need to be “grown out” before my treatment? No. We actually recommend that you shave the area to be treated. Waxing, bleaching, tweezing, or any other method that removes the root of the hair must be discontinued at least two weeks prior to treatment. Since the laser targets the root of the hair, it must be present for the treatment to be effective. What areas of the face or body cannot be treated with laser? None. All areas of the face or body can be treated with the laser that is suited for your skin type. While everyone’s pain tolerance is different, the majority of clients do not think it is painful. Our patients report that treatment with our lasers is much more comfortable than other lasers and far more comfortable than waxing. Our lasers are equipped with a DCD (Dynamic Cooling Device) that makes the treatment both comfortable and safer to the skin than other lasers. Because the lasers we use have a very large (18mm) spot size, treatments are very quick. Any discomfort one experiences is over very quickly. Will I have to use any topical numbing preparations before my treatment? Absolutely not. We do not, nor have we ever prescribed, dispensed, or recommended any topical numbing preparations (prescription or non-prescription) prior to laser hair removal. The DCD (Dynamic Cooling Device) that our laser is equipped with, eliminates the need for any topical numbing preparations. Before every laser pulse, a cryogen (cooling agent) is automatically sprayed onto the skin within the laser field that protects and partially numbs that area. This makes the treatment safer and more comfortable. Laser hair removal is a ‘lunch time’ procedure. There is no recovery or down time. Patients can return to their normal activities immediately. These lasers do not injure the dermis so the risks are extremely low. As with any procedure, you will be given an informed consent to read over that explains all the possible risks. Sun exposure or tanning beds and certain medications could possibly make the skin more sensitive to the thermal energy of the laser. For this reason, it is important to seek laser hair removal treatment only from a medical office that requires information about medications, health history, etc. prior to receiving a laser hair removal treatment. Do you sell packages, and is laser hair removal affordable? We don’t sell packages – we never insist on payment of multiple treatments up front. Every patient differs in the way that their hair responds to the treatment. Any given area typically requires an average of five to seven treatments but this can vary from person to person. This is why we price per treatment. We are confident in the way our laser performs and there is no reason to require clients to pay up front before seeing the results of a treatment. Is there a board-certified physician on-site? Yes. We are a fully-integrated medical spa and plastic surgery office. 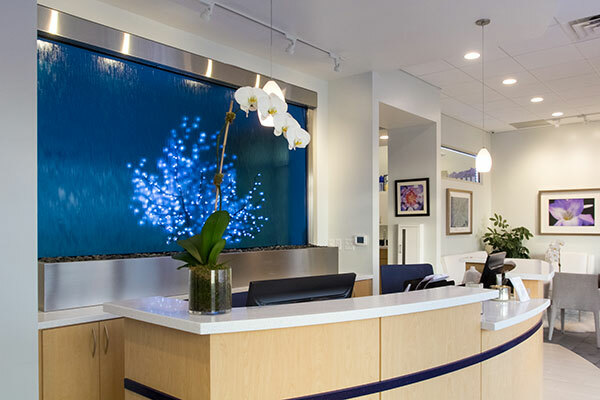 Blue Water Spa is owned and operated by Dr. Michael Law who is a board-certified plastic surgeon and his wife, Kile Law, who has over 11 years experience in training doctors and other aesthetic professionals on laser hair removal. Our office is a national training center for laser hair removal and other medical spa services. Physicians, laser technicians and other aesthetic professionals come to us for training.